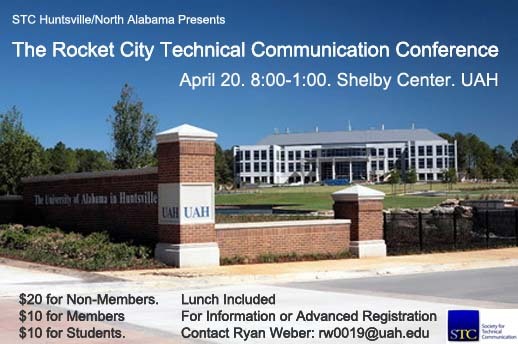 Join STC Huntsville/North Alabama for our annual Rocket City Technical Communication Conference on Saturday, April 20! The event provides a great chance for current and aspiring technical communicators to gain knowledge and participate in networking. Presentation topics include working with SMEs, developing soft skills, improving user help, developing your resume, and making connections with local organizations. The conference will be held at the Shelby Center on the UAH campus. Registration begins at 8:00 and presentations begin at 8:30. Breakfast snacks, coffee, and lunch will be provided. Registration is $20 for non-members and $10 for members and students. Contact Ryan Weber at rw0019@uah.edu for information and early registration.